Clients come in and touch the top of their head saying, “I have a headache on the top of my head.” They almost always lean forward with their chin up and turned to one side while talking. They will often bend at the waist while sitting to make this more comfortable. This problem is created by craning the neck forward while twisting the chin up and to one side. The original research talked about it being a problem with bird watchers. I find that it is more common in people watching monitors up high while twisting to one side. I have also seen this from painting the molding. You could get it from watching TV at the sports bar but looking down at the chicken wings and drinking beer breaks up the pattern, so I don’t see many of them. This muscle is almost always involved in cases of vehicular whiplash. I was looking for photos for examples and it occurred to me that a lot of models must have this headache. I’m sure that this photo of Madonna made this a popular headache in the 80s. She kind of looks like she’s in pain, don’t you think? The ice and stretch routine is very useful for this. Ice the upper part of the back of the neck and then stretch it by turning your head away from the side that you iced. Make sure to ice and stretch the sternocleidomastoid as well. Don’t worry, your trigger point specialist is trained to sort this out. 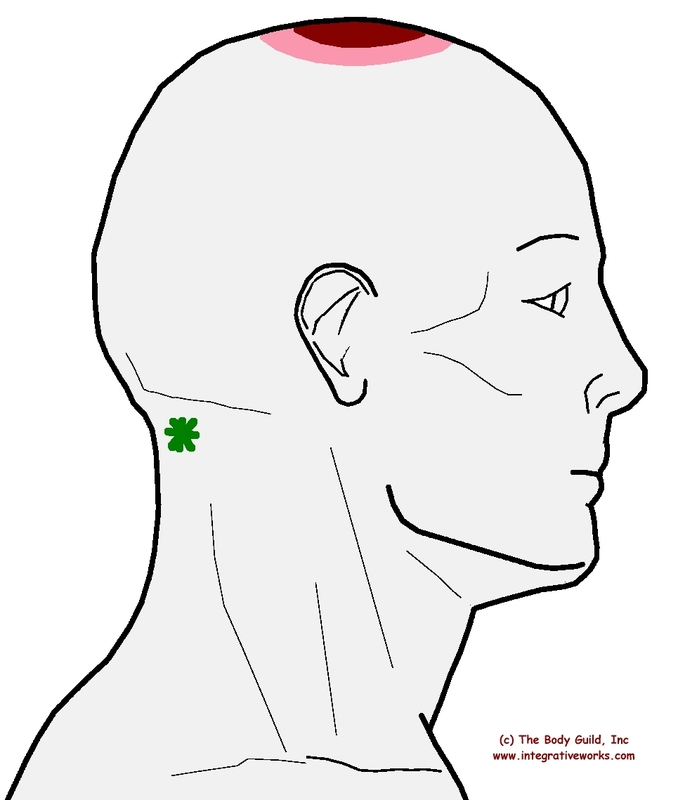 This trigger point is sustained by some joint problems in the top of your neck. They will take care of that too. Splenius capitis originates from the lower cervicals and upper thoracics and inserts on the occipital and temporal bones so that it is in a perfect position to counter sternocleidomastoid to pull the head around. It also serves as a wrap to hold the lateral neck muscles against the neck during movement. Releasing displaced joints in the upper cervicals is key for lasting relief. Some clients can accomplish this with persistent ice and stretch self-care but a good sub-occipital and lamina groove routine effective to mobilize this area. This problem can be perpetuated by head-forward posture. Pelvic balancing, upper cervical mobilization and releasing the lower, anterior cervical muscles are common strategies for moving the head back into postural balance. Stretching and changing ergonomic factors can also be key in lasting results.